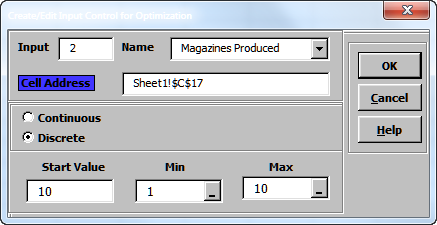 This is an example of DiscoverSim simulation and optimization to determine optimal magazine production quantity to maximize net profit. Monthly Demand is modeled using a discrete custom distribution. A DiscoverSim Input Control is used to set the number of magazines produced (x 10,000). Production and disposal costs are variable costs per unit. (Note: content and fixed printing costs are covered by advertising and subscriptions). Open the workbook Magazine Production – Optimization. A custom discrete input distribution will simulate the variability in monthly demand and is specified in cell C15. The demand quantity data for this custom distribution is given in cells F15: F24 with weights specified in cells G15:G24. The weights are converted to calculated probabilities in cells H15:H24. A DiscoverSim Input Control (Discrete) will be used to specify the magazine production quantity (1 to 10) at cell C17. This value is then multiplied by 10,000 at cell C18. The output, Net Profit will be specified at cell C28. Select Discrete > Custom Discrete Distribution. Click the input name cell reference and specify cell B15 containing the input Name “Monthly Demand” (Note: spaces are replaced with the underscore “_” character for all input names). After specifying a cell reference, the dropdown symbol changes from to . 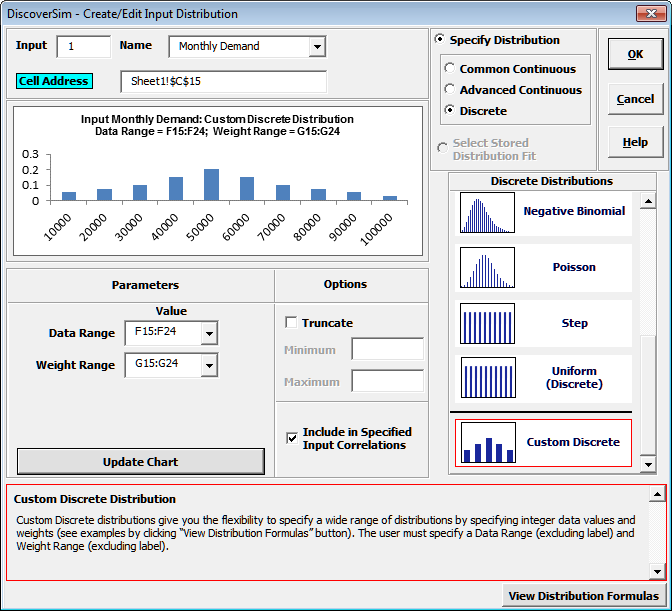 Click the Data Range cell reference and specify cells F15:F24 as the data range for the custom discrete distribution. Click the Weight Range cell reference and specify cells G15:G24 as the weight range for the custom discrete distribution. These weights are used to determine the distribution probabilities as displayed in cells H15:H24. Now we will add the Discrete Input Control (also referred to as a “Decision Variable”). This will be used to set the magazine production quantity (multiplied by 10,000). DiscoverSim will use Stochastic Global Optimization to determine what quantity will maximize the mean net profit. Click input Name cell reference and specify cell B17 containing the Input Control name “Magazines Produced”. Now we will specify the output. Click on cell C28. The cell contains the Excel formula for the Net Profit: = _Revenue - (_Total_Production_Cost + _Total_Disposal_Cost). 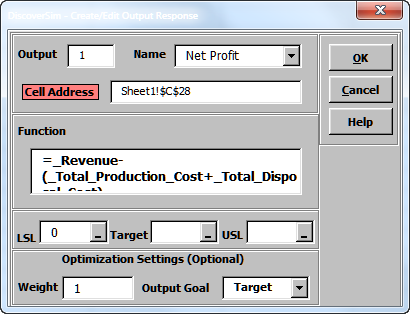 Click output Name cell reference and specify cell B28 containing the Output name “Net Profit”. Enter the Lower Specification Limit (LSL) as 0. 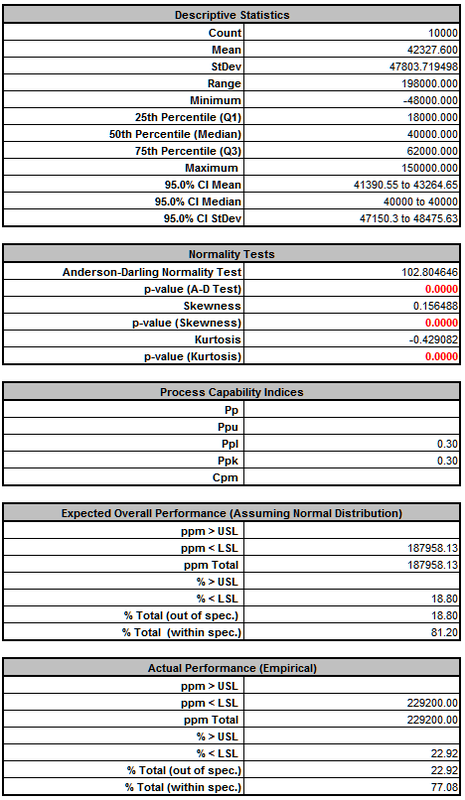 The Weight and Output Goal settings are used only for multiple response optimization, so do not need to be modified in this example. Hover the cursor on cell C28 to view the DiscoverSim Output information. 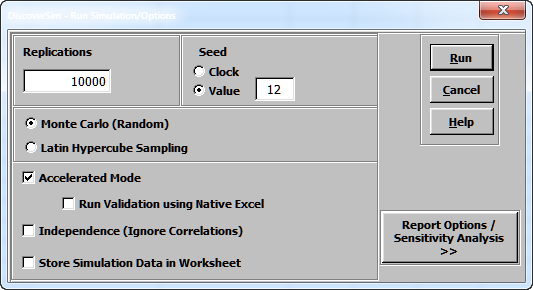 Select Seed Value and enter “12” as shown, in order to replicate the simulation results given below. 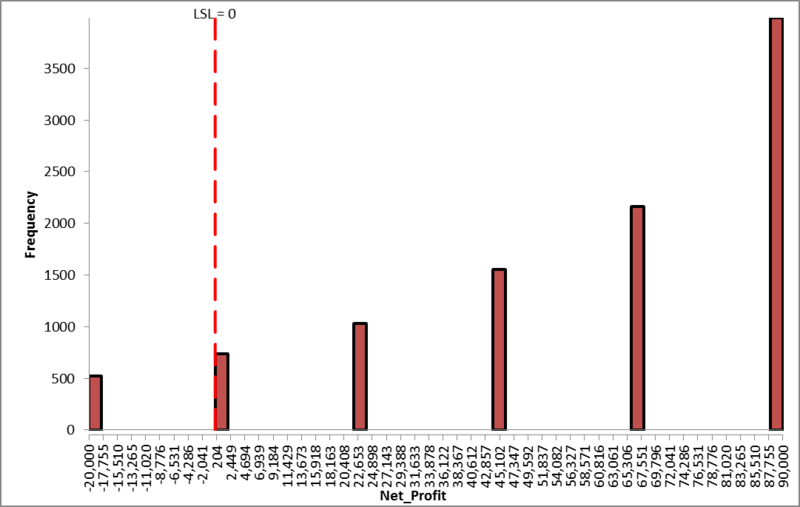 The Mean Net Profit is approximately $42,300, which is good, but we also see from the Actual Performance report, we have a 22.9% chance of monthly loss. The standard deviation is also quite high at $47,800. Here we are using the Genetic Algorithm to speed up the optimization. 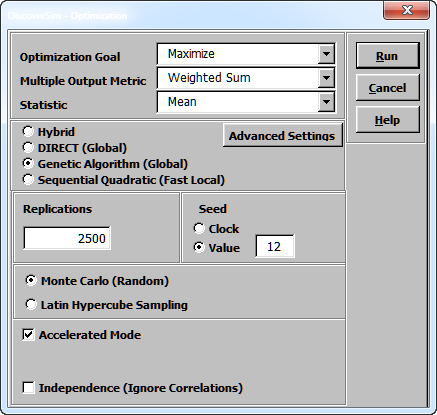 Hybrid optimization method requires more time to compute, but is very powerful to solve complex optimization problems. This particular problem is not complex, given that there is only one input control variable with 10 integer levels. In fact, one could simply try all 10 values, run simulation for each, and select the winner. However, we will let DiscoverSim do the work for us. 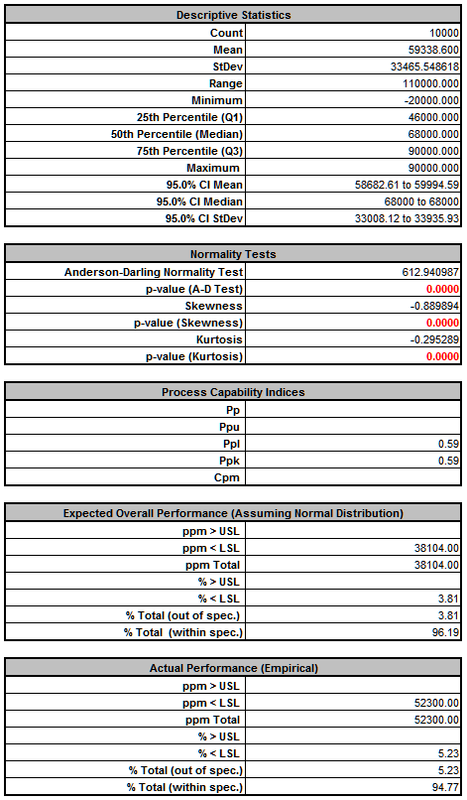 Note: Intermediate calculations of integer optimization use continuous values. Click Run. This optimization will take approximately 30 seconds. 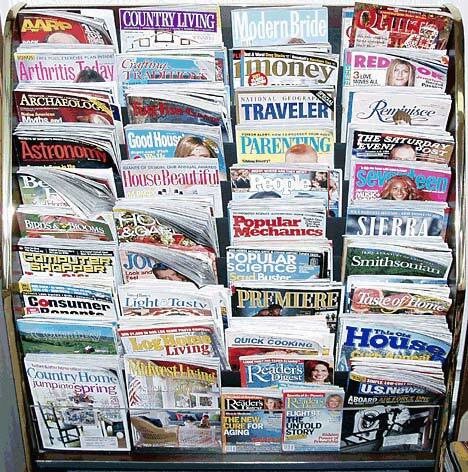 The optimum number of magazines to produce per month is 6 (x 10,000), resulting in an expected mean profit of $59,077. 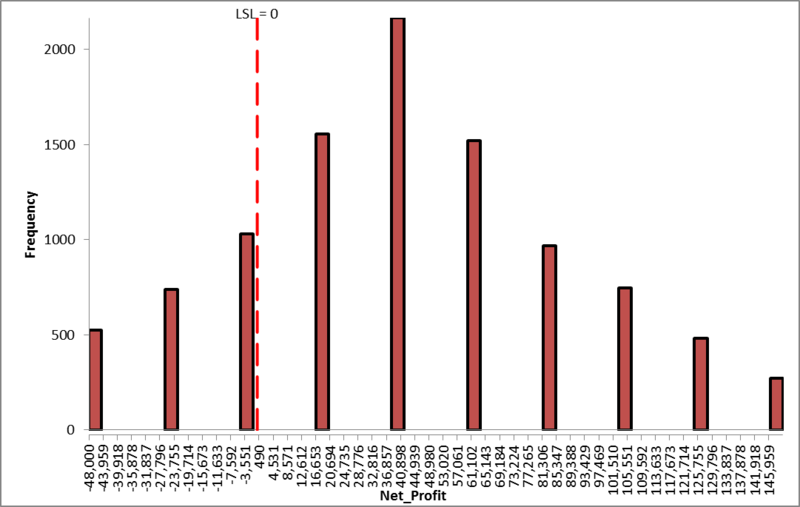 From the histogram and capability report we see that the expected mean net profit has increased from $42,300 to $59,300. The standard deviation has decreased from $47,800 to $33,500. Looking at the Actual Performance report we see a decrease in the likelihood of a profit loss from 22.9% to 5.2%. Obviously the quality of this prediction will depend on the validity of the custom distribution and does not take into account hidden soft costs like customer dissatisfaction due to lack of availability. If necessary, the model can be refined. Nevertheless, the tool is very useful to help us to determine what our production rate should be in order to maximize net profit.